Competitors at the Hanseatic Lloyd-sponsored Dragon 75th anniversary regatta in St Tropez once again enjoyed light but interesting racing for day two of this ‘once in a lifetime’ regatta. In sparkling sunshine and light, fickle winds the 270 boats drifted out to the startline and milled around for nearly one and a half hours waiting for a start. Fortunately, the race committee’s decision to keep them waiting proved correct. 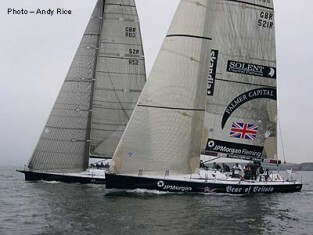 And the first race was started in a good working breeze from the south-east. An interesting starting procedure in Group 2 which saw the fleet starting with one minute to go and having to be recalled three-quarters of the way up the first beat did nothing to affect the performance of the Swedes in Maria (321) – Tom Lofstedt, Martin Alsen and Martin Larsson – who sailed a superb tactical race and led to the finish. Despite their amazing performance however, they had their work cut out keeping a weather eye on the young British team skippered by 24-year-old Mark Dicker in Scorpio who managed to score a well-deserved second. Not so fortunate however, was Ulli Libor sailing a beautiful Petticrow-built, cold-moulded three-year-old Dragon with its owner Harro Kniffka (Haseatic Lloyd’s Chairman) when it was involved in a collision with French boat on port tack. “It was so unfortunate and a great disappointment,” said Kniffka, “the other boat just didn’t give way and launched itself on to our boat, breaking the mast, boom, ripping the genoa and gashing the topside.” Fortunately, the gauge in the hull is less serious than first thought and a new mast and sail are currently en-route which means the team should be up and running again by tomorrow morning.